Finding ways to streamline the different aspects of designing, transporting and setting up complex audio systems is a constant challenge for sound companies. 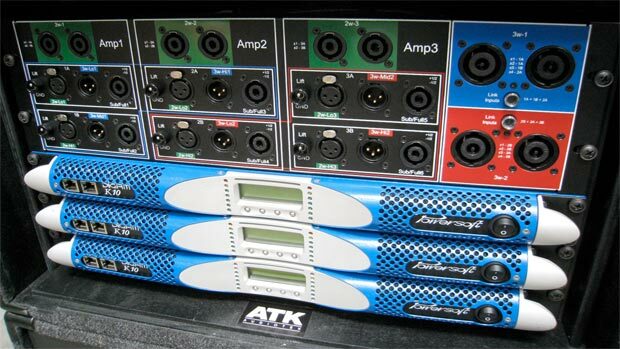 ATK Audiotek, a leading sound company that has handled high-profile events such as the Super Bowl, national political conventions, the Grammy Awards and the Academy Awards, to name a few, recently instituted a new system design approach revolving around a single type of power amplifier to drive all types and brands of speakers. To bring this design strategy to fruition, ATK purchased 450 Powersoft DIGAM K10 AESOP-equipped amplifiers to drive its inventory of JBL VerTec speaker systems along with other brands of speakers. Like most sound companies, ATK had created specialized amp packages for particular speaker types such as two-way or three-way. However, the packages contained different amp brands, with different sizes, weights, mains requirements and output power. ATK found that this traditional approach created logistics confusion and difficulties when deploying into the field. On considering the purchase of Powersoft as the amplification backbone of its entire operation, ATK saw the many benefits of the K10 as a huge piece to its plan for the future of powering its considerable investment in the speaker systems. Each K10 weighs only 26.5 lbs. and takes up one rack space making the amp packages light weight and compact for trucking and handling. 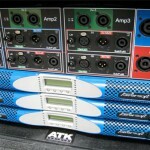 ATK can now fly the amplifiers off the stage to reduce the backstage equipment footprint. Because the K10 runs at over 90-percent efficiency, it draws much less AC power making system power distribution much easier and attainable. In this age of green consciousness, this is a big plus.